Professional advice and resources for nuisance squirrel problems. Squirrel Info: Squirrels are members of the rodent family. The most frequently dealt with nuisance squirrel is the Eastern Gray Squirrel. They measure around 16-18 inches from nose to tail and weigh approximately one pound. Gray squirrels are active year-round and arboreal, meaning that they live primarily in trees. They feed on a great variety of foods, such as nuts, seeds, fungi, fruits, and of course the seed in your birdfeeder. They store nuts and acorns in holes in the ground. 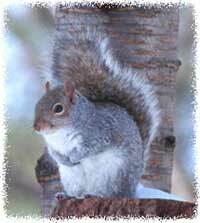 Gray squirrels breed throughout the year, but there are two distinct peaks, in the winter and summer. After about six weeks, two to four young are born, and raised in a nest for about three months. They prefer cavities in trees (or homes), and when cavities aren�t available, they will build a nest out of leaves and twigs high in a tree. Squirrels in the Attic? Click here for my special guide on How to Get Squirrels Out of an Attic, the most comprehensive guide to attic squirrel removal on the web. Nuisance concerns: Squirrels have easily adapted to humans. They frequently use buildings as nesting areas. Squirrels love to break into a house and stay in an attic or soffit. They often find a small opening and will chew a wider hole to gain access to the building. They bring nesting material into the home, and make quite a bit of noise scurrying around and caching nuts. They often fall down the chimney flue and make a lot of noise or enter the fireplace. Sometimes they fall down a wall from the attic and get stuck. They often chew their way into commercial buildings or apartments. They often enter the attic through the gable vent. Squirrels can cause a fire hazard in homes by bringing in nesting material, and by chewing on power lines. Squirrels can leave behind a lot of droppings and urine in the attic. The droppings not only smell bad, but they pose a biohazard, and the smell attracts new squirrels. I highly recommend attic decontamination services if you've had squirrels living in your attic. If you want to hire a pro after you read the below info, check out How much does squirrel removal cost? If in the attic, use a one-way exclusion door mounted on the hole, instead of cage traps. Never set cage traps inside the attic itself - it won't work. Cage traps are usually a bad option. Bait is not nearly as important as trap placement. Mount the traps right on the squirrel entry/exit holes, or on the roof or in the trees. If squirrels are chewing wood or plants or wires, use a paintbrush and spread super hot sauce. Always be aware of the baby squirrels in the attic, and wait 4-5 weeks for them to grow up and be mobile before you attempt an exclusion or trapping. Trapping: Squirrels can be trapped in small-size steel cages, and then safely relocated. It's important to use a small trap, because a large trap will allow the squirrel to run around and bang against the walls of the trap and become injured. 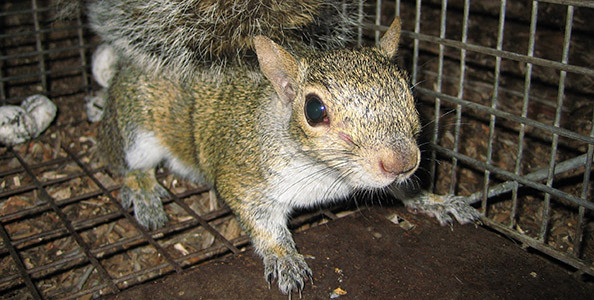 Plus, large traps tend to have very high pan tension that small squirrels can't trip. The cage should be sturdy, and it's important to set it in the shade - squirrels can die very easily from heat exhaustion. Of course, you don't want to trap every last squirrel in the neighborhood. The truth is that trapping alone isn't an effective solution. New squirrels will replace the removed ones. Plus, please be wary of catching a momma squirrel - she may have helpless baby squirrels in a squirrel nest in your attic, or in the eaves or soffit of the home, even if you don't know it. Prevention: It may be very hard to prevent a squirrel from stealing the bird seed but you can prevent them from chewing on your house with habanera sauce or Ropel spray. But if your problem is squirrels in the attic or eaves, then the best prevention is to find and seal shut all open areas into your house. The same goes for your chimney. When I do a squirrel removal job, I make sure to squirrel-proof the entire house, and seal shut all open entryways. It has to be done with steel, so that the squirrels can't chew through. Exclusion: This is how I do most of my squirrel removal work. I identify and seal shut every last opening into the house. Then I install special one-way exclusion devices on the primary entry and exit hole into the house. Squirrels have to leave the attic to get food and water, and when they do, they are excluded. This type of job has to be done properly - no baby squirrels stuck inside (experience with time of year considerations and nesting sign is very important) and chewable areas must be addressed, if the excluded squirrel is determined to chew its way back in. Exclusion is not always the best option, but it works very well in many cases, and it's easiest on the animals. Click for my squirrel removal photo gallery. Click my fabulous squirrel removal journal blog! Step 1 - Inspect the entire house (plus roof! ), and find any and all entry holes, as small as 1 inch. Step 2 - As you find these areas, seal them shut with steel mesh, which squirrels cannot chew through. But leave the biggest most obvious entry/exit hole open. It will often have chewed edges. Step 3 - Mount either a repeater trap or a one-way door directly on that main hole. Step 4 - If it's a trap, remove and relocate caught squirrels. If an exclusion door, just wait 2 or 3 days. SUCCESS - Once you hear no more scurrying noises in the ceiling or walls, you know you've done it! FAILURE - If you still have squirrels, it means you failed steps 1 & 2. You must find remaining holes. Step 5 - Optional. Clean and disinfect the attic, which is now full of squirrel urine, feces, debris, etc. DO NOT - Use rat poison. It not only fails to get the job done, it usually causes extra problems. 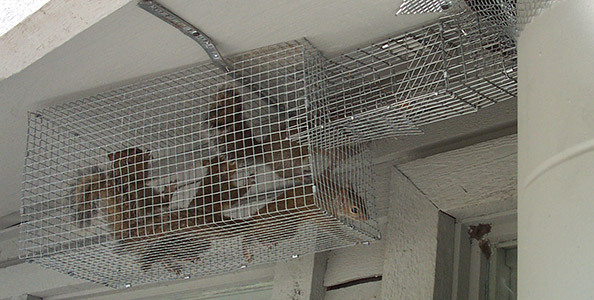 DO NOT - Set cage traps inside the attic - for some reason squirrels won't enter traps in the attic. SHOULD NOT - Set cage traps outside or on the roof - these will often fail to work, or will catch non-target squirrels. It's simply a dumb way to attempt a squirrel removal project. DO NOT - Use any kind of repellent spray, powder, sound box, flashing light. These gimmicks fail. Wondering how to get rid of squirrels? There is no magic spray or device that you can use to make them go away. Some people try to sell predator urine, such as coyote or fox urine to get rid of squirrels, but that doesn't work. They also try to sell ultrasonic sound emitters. These devices are worthless at eliminating squirrels. Some old wives' tales recommend the use of mothballs or ammonia-soaked rags to make them leave, but I've been to countless homes where these techniques failed - biologists know that these attempts won't work. The ONE AND ONLY WAY to take care of your problem is with trapping and removal of the animals, or n some cases, exclusion. People ask me - how do you get rid of squirrels in your attic - If you have squirrels in your house, chimney, attic, on the roof or other areas, you need to catch and remove them. The same goes if you want to get rid of squirrels in the walls, ceiling, or garage. Many people as me how to catch squirrels, and as usual, the key is to set the correct types of traps (6x6x18 cage traps) in the right areas (usually on the roof or bolted to the squirrel entry holes) with the right bait (peanuts and peanut butter). Trapping is really the only way to get rid of squirrels in a garden. But there's far more to squirell control than just trapping. The identification of entry points, sealing shut entry holes and prevention, droppings and urine cleanup, and the removal of babies in nests all factor into complete squirrel solutions, especially when the animals are in the house. It's often very difficult work to do properly. Most do-it-yourself jobs that I've ever seen do not solve the complete problem, and often create more problems. If you need to find a professional trapper in your hometown, just click our comprehensive list of hundreds of wildlife removal professionals, and you can have your problem quickly taken care of! Avoid trapping squirrels in cages when possible. Once in a cage trap, they become frantic and hyper, and often bang their heads against the side of the cage, severely injuring themselves. If you must trap, use a smaller trap. Also, always set the trap in a shady area to prevent death by heat stroke, and check it diligently, and relocate the animal quickly. Relocation is stressful, and sometimes the animals won't survive. Select your relocation point carefully, in an area with water. It can be hard to know if an area is suitable. Your best bet for the removal of these rodents from a house is to use a one-way exclusion door, which humanely lets them out, but not back in again. This eliminates the need for harmful trapping or relocation. If you have squirrels in the attic, 90% of the time it is a female with a litter of babies. DO NOT remove the mother squirrel before the young are grown enough to move on their own, or they will slowly starve to death then decompose and cause an odor problem. Always be sure to wait until you hear 4-5 squirrels running about in the attic. Prevention is always the best when it comes to wildlife control. Be sure you have no openings or vulnerable areas on your home that allow squirrels inside. Don't leave out bird seed or feed the squirrels, or leave attractive crops fruit on the ground, etc. If they are in the chimney, don't start a fire! Read How to Remove a Wild Animal in the Chimney. What kind of noises and sounds do squirrels make when they live in your house? How big do squirrels get? Remember, you can use my above how to guide, and follow the five steps for how to get rid of squirrels yourself. But it is not very easy for beginners without experience. I am a professional who has performed hundreds of squirrel removal jobs, and it took me more than a year, and over 50 jobs, before I really started to get the hang of it. There are many subtleties when it comes to building architecture, squirrel behavior, etc. Understanding the animal's behavior and how it relates to the architecture and the traps or exclusion doors matters a great deal in solving the problem effectively and permanently. For this reason, with squirrel removal, I am certain that a professional, with experience and proper tools, is the best option.